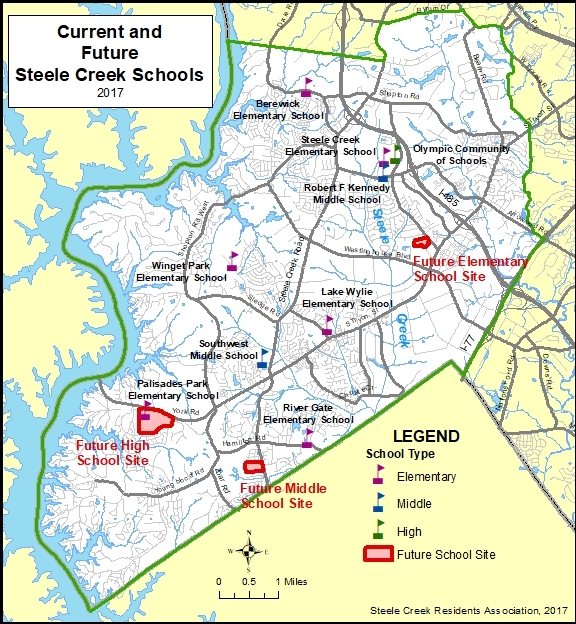 (September 22, 2017) Charlotte-Mecklenburg Schools owns (or is purchasing) three properties in Steele Creek where future schools will be constructed. Two of these schools will be constructed from funds included in the $922 million School Bond issue on the November 7 ballot. 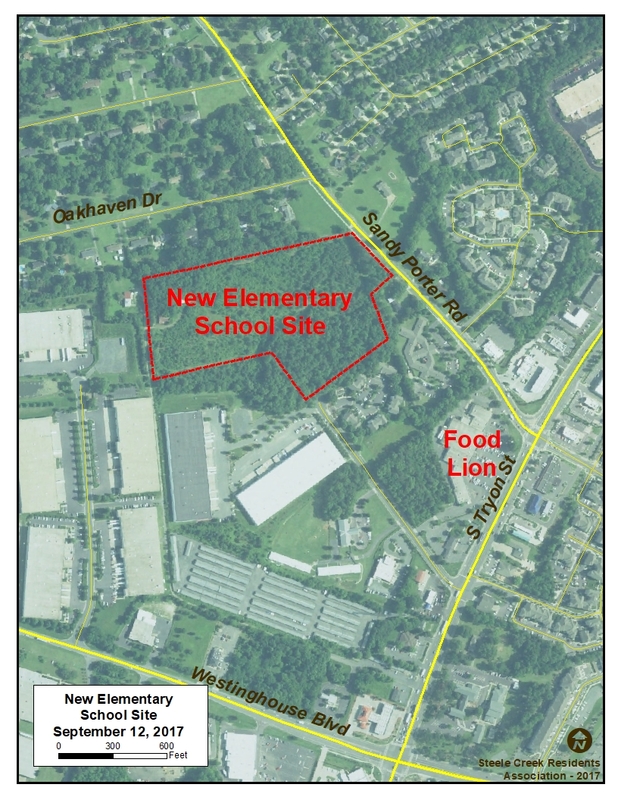 The Board of Education approved the purchase of approximately 19.75 acres in five parcels on Sandy Porter Road south of Oakhaven Drive and near the Food Lion shopping center at its meeting on September 12. (See Board Meeting Agenda Item.) 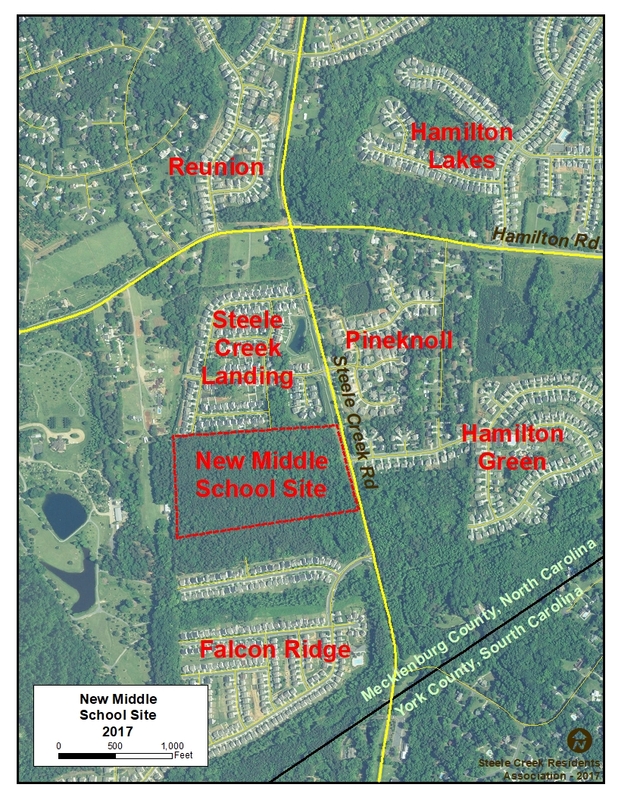 The property will be used to develop an elementary school to relieve Nations Ford, Steele Creek, and Sterling Elementary Schools. The total purchase price is $1,600,000 to be paid to three different owners. The property is comparable in size to the 18.08 acre site of River Gate Elementary School. Mecklenburg County voters will see a $922 million School Bond issue on the November 7 ballot. This includes $29.2 to construct this new elementary school in Steele Creek. CMS acquired a 30.5 acre plot of land in 2007 and 2009 on Steele Creek Road south of Hamilton Road. Funding for construction of this school is not included in the current bond and will need to be included in a future bond. 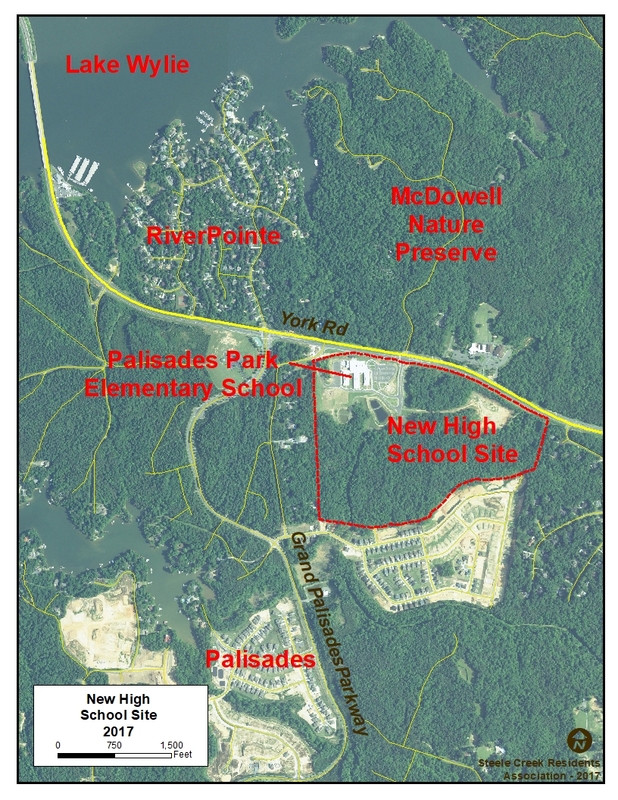 Charlotte-Mecklenburg Schools acquired a 112 acre site adjacent to The Palisades as the site for an elementary school, a high school, and a neighborhood park in 2008. Palisades Park Elementary School opened in 2014. The $922 million School Bond issue on the November 7 ballot includes $110 for a new relief high school for Olympic to be built on this site. In 2009 Mecklenburg County Park and Recreation Department released a plan for a neighborhood park and several trails on the site. Palisades Park neighborhood park opened when the elementary school opened in 2014. Trails likely will be built as part of the high school construction. Since the plan was prepared by the Park and Recreation Department rather than CMS, it would not necessarily represent the eventual placement of the school. See Plan for Neighborhood Park at the Palisades Released.